Keen as mustard to celebrate a truly world-famous pastry and the town of Eccles itself, the organisers approached your favourite protagonist and requested my assistance. Once I caught wind of their plan to bring Mr. James Birch back to life (moving him from his 18th century existence and into the present day), I just had to accept this most gracious of offers to play him. And I must say, I've had enormous fun. Last week, in character as James Birch, I have brought joy through the giving of Eccles Cakes to musical legend (and all round good egg), Mr. Clint Boon off of Inspiral Carpets fame. As the ‘drivetime’ disc jockey on the ever-popular XFM Manchester wireless station, Mr. Boon told his avid listeners that my generous giving of Eccles Cakes made his day. As if that wasn't enough, I have also been interviewed in character for Capital F.M. Manchester; been thrust in front of a television camera for The Quays News; made a splash in the Salford weekly newspaper and even been involved in a Twitter Takeover for @VisitSalford. Bracing stuff indeed. To cap it all off as it were, today ‘James Birch’ spent the day right in the heart of Eccles town centre to conduct a blind taste test between the Eccles Cake and it’s local adversary, the much inferior Chorley Cake. Born in the year of our Lord, seventeen hundred and fifty two, James Birch was the son of James Birch of Pendleton. 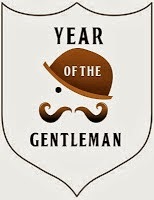 As a baker and corn miller, he assumed the title of shopkeeper in seventeen hundred and eight five. In need of larger premises, most likely owing to a rising demand in Eccles Cakes, Mr. Birch moved his business empire across t’road. This is where it gets interesting, ladies and gentleman, so please do not give up just yet. His one-time apprentice, William Bradburn set up shop in Birch’s old premises and being quite the bounder, he directly competed against his former chief by selling Eccles Cakes too. 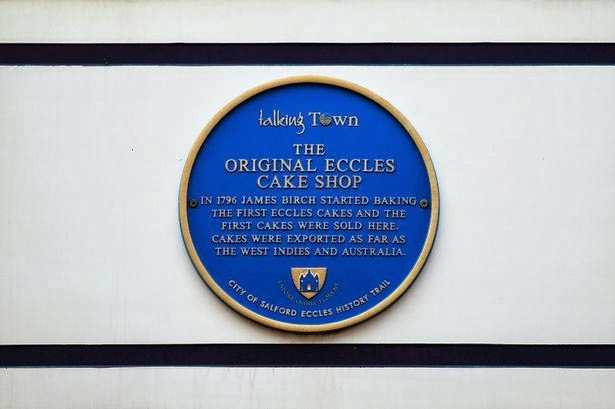 A rather unseemly spat subsequently broke out involving the two master bakers – Birch advertised that he was the original Eccles Cake maker removed from across the way, but Bradburn retaliated with a sign claiming that his shop was the only original Eccles Cakes Shop. Never removed. Quite why they couldn’t adopt a more gentlemanly attitude and resolve their differences over an Eccles Cake is beyond me. Or failing that, a good old-fashioned duel to the death. 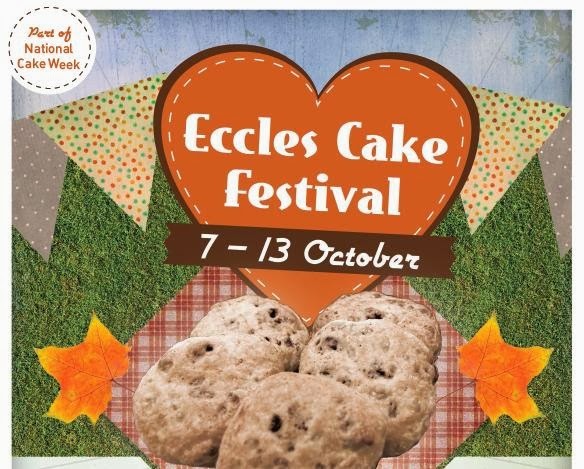 This is the first ever Eccles Cake Festival and hopefully it won’t be the last. If this sounds like your cup of tea, you can still get involved. There is the Cake Break where the challenge is to find who can take the Eccles Cake the furthest or to the most unusual location (both with photo evidence, naturally). Then there’s the Cake and Custard drawing competition where children are asked to share what they like to eat with an Eccles Cake. By all accounts, Eccles Cake and tripe was a favourite of Mr. Birch. 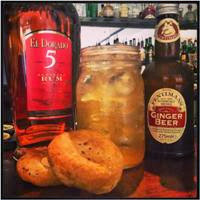 I’d like to leave you with a little recipe to make a cocktail version of this local delicacy (minus the tripe), dubbed the ‘Caketail’, concocted by Manchester’s very own Drinks Enthusiast, Mr. Dave Marsland. Signing off until next Saturday.